Astronauts on the International Space Station are keeping a close eye on the investigation into the recent crash of a Russian rocket in order to learn how it will impact their mission in orbit. The Soyuz rocket was carrying Russia's Progress 44 supply ship for the International Space Station, which was expected to deliver 3 tons of supplies to the orbiting lab's six-man crew. Instead, the rocket and cargo ship crashed in eastern Russia after a malfunction in the booster's third stage forced an engine shutdown. "It's a pity the launch of Progress resupply vehicle didn't go well. Experts have worked on the investigation of its various impacts," station astronaut Satoshi Furukawa of Japan wrote on Aug. 26, two days after the crash, on Twitter, where he posts updates about his mission as @Astro_Satoshi. "But, as there are plenty of supplies to support the crew, we'll be fine for a while." Since Russia's Federal Space Agency uses similar versions of its Soyuz rocket design to launch unmanned Progress vehicles and its crewed space capsules, officials want to make sure that they are safe to carry astronauts and cosmonauts. The next Soyuz to ferry a crew to the station was slated to launch Sept. 22 to replace three astronauts who are due to return home on Sept. 8. Those plans may now change, the astronauts said. It's possible that the launch of the new station crew will be delayed until the crash investigation is complete, and that may force the three returning crewmembers to stay in orbit longer than planned. Garan is one of the three astronauts who would have to extend their stay on the space station. They were due to land next week to end a six-month spaceflight. "Up here, we're in kind of a wait-and-see mindset," Garan said. "We're fully prepared to support whatever decisions are made." NASA will hold a press conference today at 10 a.m. EDT (1400 GMT) with the latest on the crash's impacts on the space station crew. 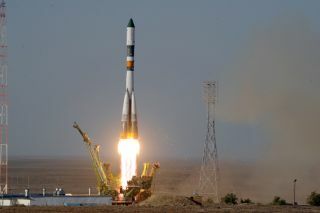 Before the Progress 44 crash, Russia was expected to launch four Soyuz rockets —two carrying new crews and two with unmanned Progress cargo ships — as part of the regular flight schedule. "If things extend too long, which we don't have any indication today that's the case but given the anomaly we have to be prepared, there is an ability to operate station with less than six crew if that becomes necessary," NASA's space station program manager Mike Suffering told reporters last week just after the rocket crash. With NASA's space shuttle fleet retired (the final flight was in July), Russia's Soyuz space capsules are the only vehicle currently ferrying astronauts to and from the International Space Station. Robotic cargo ships built by Russia, Japan and the European Space Agency also make deliveries to the orbiting lab. NASA currently has contracts with two private U.S. spaceflight companies, SpaceX and Orbital Sciences, to provide unmanned cargo deliveries to the station in the next few years. Test flights for those vehicles are expected in the coming months. NASA also plans to eventually use commercial spacecraft for astronaut launches, too. However, Russia's string of rocket and satellite failures in the last year that has caused some concern among U.S. lawmakers and experts since the country is also the sole avenue for American spaceflight until the new private spaceships become available. Suffredini said he is confident NASA's Russian partners will find the cause of the Soyuz rocket malfunction and resume flights as soon as it is safe to do so. "We're trying, right now, to give our Russian colleagues time to collect the data," Suffredini said. "Really, what you need right now is time." Space station crew size cut ahead? The space station currently has enough supplies to support a full, six-person for about 50 extra days beyond the scheduled Sept. 8 return of Garan and his crewmates, Suffredini added. There are enough supplies to support a smaller crew through at least March 2012, when the next European space freighter is due at the station, he said. Suffredini also said that, barring an unforeseen major system or equipment failure, the space station could be even be flown without a crew for up to a year. Such a move, however, would be unprecedented. The $100 billion space station has been continuously inhabited by crews of various sizes, from two-person skeleton crews to a full complement of six, since the first crew took up residence in 2001. The space station was completed earlier this year after more than a decade of orbital construction. It is larger than a football field and can be easily spotted by observers on Earth at night if they have clear skies and know where to look. Space station officials are hopeful Russia's Soyuz rocket crash will be solved in time for the next scheduled launch of a Progress cargo ship, which is slated for late October. On the space station, the astronauts said they, too, are confident that Russia's rocket issues will be solved, and that they are ready for any challenges, be it a decision to extend the current crew's mission or cut the station crew size in half temporarily. "Obviously, I would have mixed feelings … I mean I've been away from home for a long time. But a lot of people are away from home doing things that they believe in," Garan said, adding that at the very least he'd have more time to share his spaceflight experience with people on Earth. "So there's an upside and a downside and whatever the decision is, I think it will be what's best for the program and we'll fully support it."